The Cloud Dream of the Nine (Kuunmong) is a 17th century Korean novel set in 9th century China. On the surface it is an entertaining tale of a young man who travels through two lifetimes accompanied by eight beautiful maidens; at its core, it is philosophical novel about Buddhism and Confucianism. The author, Kim Manjung, wrote the novel while in exile, reputedly to console his mother. The result has pleased thousands of readers in the following ages. The Cloud Dream of the Nine is a pre-modern Asian novel, and as such, does not conform to the model of the novel as it formed in the modern West. 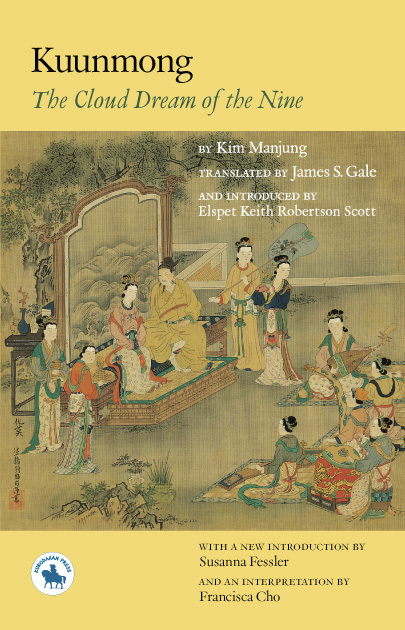 For contemporary readers, both Western and Asian, the cultural challenge of Kim Manjung’s work lies not in its remote historical setting--which happens to be 9th century China, but rather in its literary qualities, which reflect the world of 17th century Korea. Kim Manjung was a product of Korean yangban (‘two orders’) culture: a system based on Chinese models, which required even elite members of society to pass civil service examinations. At first, Kim proved a success in this system: he rose rapidly through the social ranks, placed at the top of the state examinations when he was twenty-eight, and attained a high position at court. But reversals of fortune followed on his success, and Kim was often forced into political exile. He wrote Kuunmong during one such period, in 1687. Five years later, he died, at the age of fifty-five. He meant his novel to be a private act of protest, and a consolation for his family. In the centuries that followed its author’s death, Kuunmong has gone on to attain lasting fame. James Scarth Gale was born in Canada in 1863, attended university in Toronto, and spent most of his life working as a Presbyterian missionary in Korea. He began to publish books about Korean language and culture as early as the 1890s, and for ten years he worked on the project to translate the Bible into Korean. He married twice: his first wife was the widow of a former court physician to the Emperor of Korea; his second wife was a Western woman from Yokohama, Japan. Gale wrote many books of enduring importance to students of Korea, notably his translation of Kuunmong (1922), and his monumental History of the Korean People (1927).